Corylus Avellana is of course a British native know as hazel. It has huge commercial use for thousands of years, being used to make all forms of items from charcoal to hazel fencing know as wattles. It’s main are of use is of course the hazel nut, loved by us for 1000s of years. The botanical name comes from the Greek word korys meaning helmet, from the calyx that covers the top of each nut while Avellana is named after the Italian town Avella, the centre of nut production many years ago.This form ‘Contorta’ commonly called the corkscrew hazel and Harry Lauder’s walking stick after a famous Victorian comedian, was discovered in a hedgerow near the small village of Frocester, Gloucestershire in 1863 by Canon Ellacombe. He was a very well respected gardener, who passed it on to his great friend, Edward Bowles who grew it at his home, Middleton House. 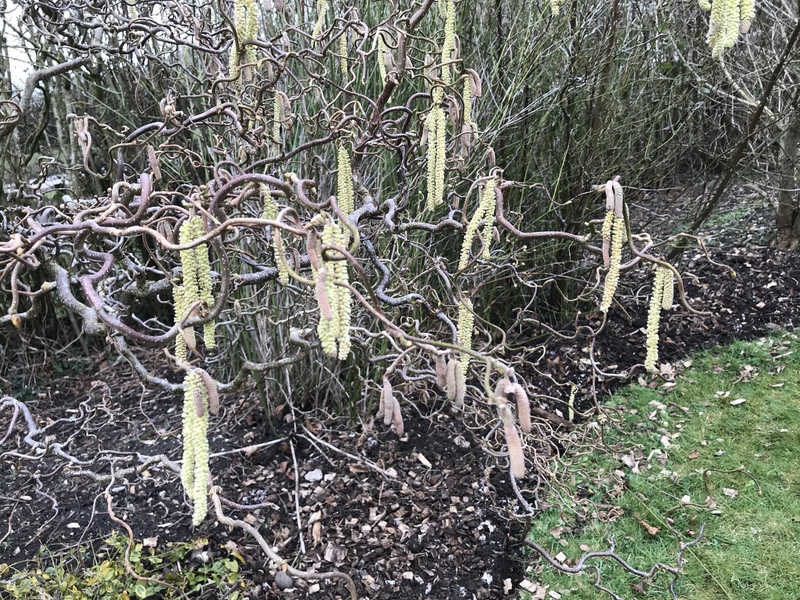 Corylus Avellana ‘Contorta’ is a slow growing shrub, making a height of about 15ft in 20 years or so, it’s contorted stems look beautiful in the garden. Like all hazels, it prefers a nice loamy soil but it will grow in most soils including sandy, clay and chalky soils. It will take a quite a bit of shade being a woodland shrub but it also grows well in full sun. It doesn’t need a lot of care, just some mulch of well rotten compost or green waste and Vitax Q4 to keep the soil fertile. The leaves are like normal hazel leaves and the large male yellow catkins I find, are borne a little later than the straight form. The female flowers are much smaller and almost like a red spider and are found on the main stems. They are pollinated by the wind. Corylus Avellana ‘Contorta’ is general disease free but it does suffer a few pests like the normal aphids, sawflies, gall wasps and a few butterflies and moths lay their eggs on it like the large emerald, small white wave, barred umber and nut-tree tussock. The nuts are also eaten by a wide range of animals but famously as food for the dormouse. There is also a purple form called ‘Red Majestic’ that is for some reason rarely offered but should be! Corylus Avellana ‘Contorta’ is propagated by grafting on to straight Corylus Avellana in most Nursery propagation so any long and straight stems need to be removed. It is possible to propagate by hard wood cuttings taken in late November but they are well known for being difficult! It doesn’t need any form of pruning, stems that are growing the wrong way or coming out too far can be pruned back either during the growing season or in the winter. Like all hazels, it can be copiced hard back, down to a stump if required, in late winter. This method is ideal to do every 2-3years if the stems are required for use in flower arranging. Oh GAK! This is another one of those exquisite plants that landscapers with something to prove will use in the wrong situations, just to show off. We have a few of them; dawn redwood, Japanese maple, yellow clivia and so on. One of my former clients had two very nice specimens, in an ideal landscape for them; but that is rare. Most end up hedged along with everything else, or out in a lawn as a shade tree (?). Yes, I would rather not see it at all than see it abused!